In a presentation to this year’s annual meeting of the American Economic Association, Alan Blinder argues that the circumstances—low inflation and low nominal interest rates, persistent excess capacity, and fiscal policy paralyzed by large debts—that have forced central banks to operate through unconventional policy will be a recurring feature of the economic landscape. “We can’t stuff the crazy aunt back in the closet”. According to Economist Magazine, of the rich world’s four major central banks, Britain’s and Japan’s already have their policy rates stuck near zero and the fourth, the European Central Bank (ECB), is likely to get there this year. Meanwhile, the balance-sheets of all four institutions have ballooned as they expand the volume and range of assets and loans they hold (see charts below). Whatever central bankers do, they cannot repair problems best fixed by politicians, such as America’s incoherent fiscal policy or Europe’s fractured institutions. Asked about the ECB’s aggressive new lending to banks, Masaaki Shirakawa, the governor of the Bank of Japan, said it could “buy time”. But he warned it could backfire if politicians fritter away whatever time the central bank has bought. Unfortunately, that risk is never low. Interview of Chicago Fed’s president Charles Evans, one of the vocal doves on the Fed’s Open Market Committee (or FOMC). Evans advocates the Fed should target on employment growth, and consider raising inflation target to 3%, instead of 2%. …Mr Bernanke can and should use his speech today to explain how his policy intentions are conditional upon future developments. A clarification could help the economy in two ways. First, he could signal that a temporary increase in inflation will be allowed, before policy tightening is warranted. This would stimulate spending by lowering real interest rates. Second, specifying the size of any permanent price-level increase would avoid an increase in uncertainty about the long-run price level. This in turn would ward off an increase in inflation risk premiums that might otherwise counteract the desirable effect of the increase in near-term inflation expectations. Uncertainty about the economic outlook is likely now the most important obstacle to a more robust recovery. The problem is not just uncertainty about Fed policy, but the fact that the Fed has become harder to “read” does not help. Better Fed communication, long on the agenda, would be particularly helpful at this juncture. Jackson Hole provides Mr Bernanke with the ideal opportunity. My problem with Woodford’s recommendation is, how can the Fed convince people that the raise of inflation target is going to be temporary? What if employment situation won’t get any better after raising inflation target to 3%? Will 4% then be tolerable? Will this generate a positive spiral of inflation (expectations)?? Roach questions the Fed’s monetary policy channel through wealth effect, which is prone to generate asset bubbles one after another. He also thinks the Fed should change its narrow policy objective of price stability, but to ensure broader financial stability. March 15, 2011 / 1 Comment on America in releveraging? America’s financial sector is still undergoing the deleveraging process – Big banks are busy in repairing their balance sheets, gradually writing off their losses in housing bubble era. But with Fed’s super easy monetary policy and easy access to the dirt cheap credit, there seems to be a divergence in terms of attitude toward credit. The main street corporate America now is the one who carries the credit torch forward. With interest rate expected only to rise (not fall), America’s corporations are borrowing like there is no tomorrow. This is being reflected in the junk bond market, where yields again fell close to the 2007-level low. Is another credit bubble in the making? Are we going to see a flurry of corporate defaults in coming years? Is the Fed just delaying the inevitable? 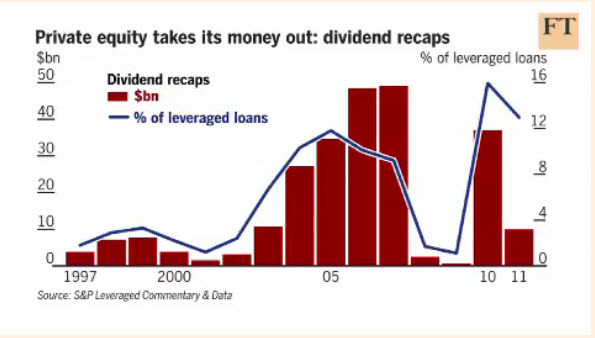 This FT video may offer you some insights to the issue. Vincent Reinhart discusses the Fed’s monetary policy outlook – Fed first need to unload its balance sheet before raising rates. 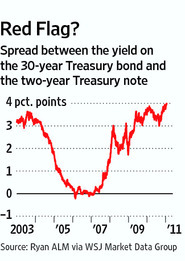 Treasurys may be signaling trouble. Consider the Treasury “yield curve.” It refers to the difference between short-term and long-term interest rates on U.S. Treasury debt. Typically, as the economy is expanding, this curve has an upward slope, and is usually at its steepest during the earliest stages of a recovery. Eventually, investors anticipate the Fed will begin raising interest rates to stave off inflation. That tends to lift short-term rates, compress long-term ones, and generally flatten the curve, or even invert it if investors expect the outcome could be recession. Lately, with the U.S. growth outlook improving, the slope of the curve hasn’t started flattening, as might be expected at this point in the recovery. Instead, it has gotten steeper. Earlier this week, the spread between two-year and 30-year Treasury yields hit a record-wide four percentage points, notes RBS Securities. At the same time, the implied annual inflation rate over a five-to-10 year horizon, based on Treasury yields, has moved up above 3% and towards levels last seen before the Fed’s previous rate-rise cycle began in mid-2004. Investors, in other words, don’t expect the Fed to be as aggressive as in the past in raising rates—even as they see inflation on the rise. “I think the Fed’s credibility is in question here,” says Priya Misra, head of rates strategy at Bank of America Merrill Lynch. Or perhaps investors simply realize the Fed has put itself between a rock and a hard place. The U.S. unemployment rate is currently 9.4%, after all. It was at 5.6% in June 2004. In a twist, the best scenario for the U.S. now is that interest rate increases in China, Brazil and other emerging markets rein in global cost pressures, giving the Fed—and the recovery—some breathing room. The U.S. needs strong growth more than ever, especially with limited appetite for serious fiscal overhaul, to assuage the market’s other worry: wide deficits and heavy debt. Interview of Cathy Mann at Brandeis University. She noted there was inconsistency in the Fed’s monetary policy —given the current unemployment rate, the Fed can’t be fighting inflation and unemployment at the same time — Either the Fed will have to give up their target on unemployment rate (6%), or they’ll have to give up their inflation target. And since neither QE1 or QE2 did much to job creation, it’s better to give up the target on unemployment rate, rather than letting the market form expectations that inflation is going to get out of control.